“Dr. Page and her staff were courteous, attentive and knowledgeable. While at Capital Smiles, I received focused, conscientious care, which left me thoroughly impressed. Dr. Page displayed professionalism and a demeanor which suggested a commitment to my individual care. She thoroughly explained my case and willingly spent time to answer all of my questions. My experience at Capital Smiles was both pleasant and comfortable. It is without reservation that I recommend Dr. Page and the entire Capital Smiles team! Thank you, Dr. Page!" Dental implants are the only treatment that restores a tooth both above and below the gum line. A prosthetic root is placed into the jawbone, and a custom-made restoration is attached to the top. They look just like natural teeth because they are built just like natural teeth, helping them fit seamlessly into any smile. Once a tooth is lost, the jawbone in the area naturally starts to shrink and change shape, which can affect the overall appearance of a patient’s face and lead to that sunken look we’re all familiar with. Dental implant posts actually stimulate the growth of new bone in the jaw once they are placed, meaning they not only fill in the gaps in the smile, but they also help the jaw, and therefore the entire face, maintain a more healthy and youthful appearance over time. Other tooth replacements such as bridges and dentures typically need to be replaced every 10 years or so, but with the proper maintenance, dental implants can easily be expected to last for 30 or more. How can you ensure their longevity? All a patient has to do is brush, floss, and regularly see their dentist for maintenance appointments. Removable dentures are notorious for slipping and sliding around in the mouth, but dental implants can enable a patient to finally have a set of teeth they can trust. 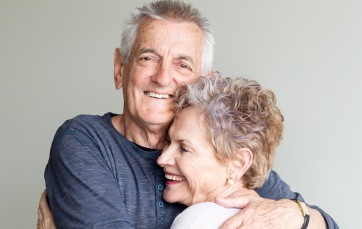 With a sturdy implant-retained denture, a patient will enjoy a secure hold, a comfortable fit that lasts for years, and a much stronger bite that allows them to enjoy a wider variety of foods. All in all, dental implants are truly in a class of their own. If you’re interested in learning more about dental implants, or if you’re ready to schedule an appointment with your Capital District implant dentist, contact us today.